This is Paul Kemp's first SWEU book and not quite as good as Star Wars: Deceived, which is one of my favorite space opera reads ever and a book that could be just as good set outside the EU as well. Not to be missed. Crosscurrent on the other hand, shows growing pains, which makes since since it's Kemp's first foray here. But he's more than up to the challenge. To me, the book didn't take off until the introduction of Khedryn Farr and his co-pilot Marr. They are dynamic and well developed with good banter, the kind of characters at which Kemp excels. Instead, the darkness of early chapters combined with the generic feel of Jaden, Relin, Kell and Saes makes the book a bit hard to get into. But after Chapter 5, it takes off with Khedryn and Marr adding much needed energy and lightness and helping bring out the best in the other characters they encounter. The plot is solid--a 5000 year old Sith ship winds up through a jump failure caused by a sabotaged drive, transported into the future and encounters Jaden and the two pilots who are investigating a distress call on a moon containing an abandoned, top secret Imperial compound/lab. Kell, on a quest to kill Jaden, follows them there and while Resin, who came forward in time with the Sith dreadnaught commanded by Saes, seeks to revenge the death of his latest Padawan by his former Padawan turned Sith, Saes, Jaden and Khedryn head off to investigate the emergency. This leads to divergent battles, some of which are satisfying, but not all. The battles with Jaden v. Kell and Relin v. Saes were too short, with the bad guys easily dispatched. After all the great anticipatory tension Kemp created getting there, I found that a disappointment. And it's not due to lack of skill. Besides Deceived, which does the stuff so well I used it to inspire me in writing such scenes for my own space opera novel series, the precursor encounters of Khedryn v. Kell and Marr/Relin v. Sae's bodyguards are well written but they are obstacles and precusors to the climactic confrontations which never quite fulfill the set up. Still, Kemp is a strong writer. And I look forward to seeing how Jaden, Khedryn and Marr handle the sequel Riptide now that their relationships are well established and fun. It should be interesting and given that it came out the same year as Deceived is likely a more masterful effort and demonstration of Kemp's talent. 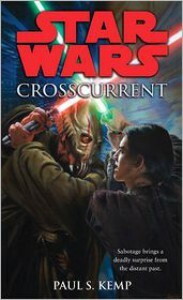 This duology is also of interest for its exploration of the later years of the EU and a period not well covered as well as bringing Jaden Korr from the Jedi Academy into EU books and history and developing him further. Worthwhile, especially for fans.